Holi Festival is an Indian festival of colors. India people are in a festive mood at this time. Everyone are happy, dance on Bollywood Holi Songs and they have done lots of fun. Holi celebrated in whole India but it is very special in Mathura and Vrindavan. There is 7 events schedule of Holi Festival and each event is called by their names. We always use to play with colors, Gulal and water Balloons with our friends, family and dance on Bollywood Holi songs. There is a big role of Bollywood songs. Go Pagal is the Beautiful Bollywood Holi Songs of 2017 from the movie Jolly LLB 2, it is starring Akshay Kumar and Huma Qureshi. The Singers are Raftaar and Nindy Kaur. The Music Director is Manj Musik. Raftaar and Manj Musik have written the Lyrics for this song. Badri Ki Dulhania is Bollywood Holi Song 2017 from the Movie Badrinath ki Dulhania, it is starring Alia Bhatt and Varun Dhawan. The Singers are Dev Negi, Neha Kakkar, Monali Thakur and Ikka. The Music Director is Tanishk Bagchi. Shabbir Ahmed has written the Lyrics for this beautiful song. Balam Pichkari song is from the Movie Yeh Jawani Hai Deewani, it is starring Ranbir Kapoor and Dipika Padukon. The Singers are Vishal Dadlani and Shalmali Kholgade. The Music Director is Pritam Chakraborty. Amitabh Bhattacharya has written the Lyrics of this song. Hori Khele Raghuveera song is from the Movie Baghban. It is featuring Amitabh Bachchan and Hema Malini. The Singers are Amitabh Bachchan, Alka Yagnik, Sukhwinder Singh, Udit Narayan. The Music Director is Aadesh Shrivastava. Sameer is the lyricist. 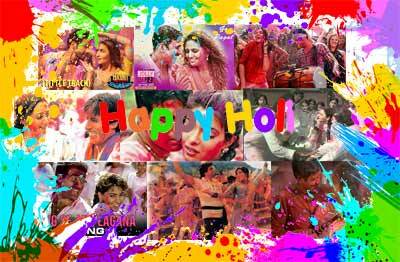 Do Me A Favour Let’s Play Holi song is from the Film Waqt – the Race against time. It is starring Akshay Kumar and Priyanka Chopra. The Singers are Anu Malik and Sunidhi Chauhan. The Music Director is Anu Malik. The lyrics are written by Sameer. Rang Barse song is from the Movie Silsila. The Star cast of this song Amitabh Bachchan, Shashi Kapoor, Jaya Bachchan, Rekha and Sanjeev Kumar. The Singer is Amitabh Bachchan. The Music Composer is Shiv-Hari. Javed, Rajendra Krishan, Nida Fazli, Hassan Kamal and Dr. Harivansh Rai Bachchan have written the Lyrics for this beautiful song. Ang Se Ang Lagana song is from the Movie Darr. It is featuring Shah Rukh Khan, Juhi Chawla and Sunny Deol. Alka Yagnik, Devki Pandit, Sudesh Bhosle and Vinod Rathod are the Singer. The Music Director is Shiv-Hari. The Lyrics are written by Anand Bakshi. Holiya Mein Ude Re Gulal song is a Rajasthani Album song. The Singer is Ila Arun. Holi Ke Din song is from the Film Sholay. It is starring Dharmendra, Hema Malini, Amitabh Bachchan and Jaya Bhaduri Bachchan. Kishore Kumar and Lata Mangeshkar are the Singer. The Music Composer is R. D. Burman. Anand Bakshi is the lyricist of this song. Aaj Na Chodenge song is from the movie Kati Patang starring Rajesh Khanna and Asha Parekh. The singers are Kishore Kumar and Lata Mangeshkar. The Music Director is R.D. Burman. Anand Bakshi has written the lyrics of this song. Ja Re Hat Natkhat song is from the Bollywood movie Navrang. The singers are Asha Bhonsle and Mahendra Kapoor. The Music Director is C Ramachandra. Bharat Vyas has written the lyrics of this song. Keep in touch with filmytune.com to know more Bollywood Holi Songs.